Sunderland have decided not to take up the option to sign on-loan Inter Milan midfielder Sulley Muntari. The 26-year-old midfielder joined the Black Cats from the Italian side in January and has made seven starts and two outings as a substitute. 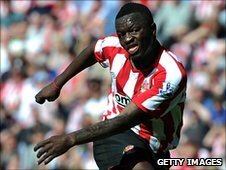 "Sulley has been a great professional in his time here," said Sunderland manager Steve Bruce. "Naturally we'd like to thank him for his contribution and wish him all the best for the future." Muntari's agent, Fabien Piveteau, had claimed Sunderland would not try to sign the Ghanaian midfielder because of his wages. "There is no chance at Sunderland for Sulley. They have decided he is too expensive," said Piveteau. But Piveteau, who also represents Ghana's John Mensah, is confident the defender does have a Black Cats future. "For John there is a good chance," Piveteau added. "The situation with him is that if he played 25 games he would definitely sign for Sunderland but he has only played 18 at the moment. "He has not played all of the games but it has been a different type of injury this season for John. "At the moment I think results are the priority, but the coaches will talk with him soon about next season." Mensah is in his second loan spell at Sunderland from French side Lyon but his season has again been ruined by injury. Muntari, meanwhile, has failed to score in eight league games for the Black Cats.